Being a street singer is not easy, though it seems fun. This man from Malaysia was about to quit singing and go home that day as not many people gathered to listen to his voice. But as h started to sing his last song for the day, he got the cutest audience ever. A lovely group of four small kittens came to support him! The cute 3-months old kittens sat in front of the musician as if they knew his feelings and wanted to provide him courage. The kittens even started to follow the beat nodding their little heads. They stayed until the end and the artists thanked each of them for staying and watching his performance. 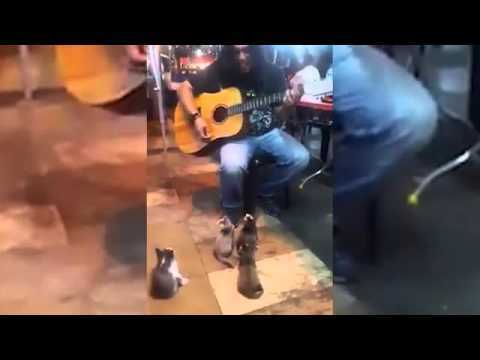 The Cute 3-months Old Kittens Sat In Front Of The Musician As If They Knew His Feelings And Wanted To Provide Him Courage.